Honeybee pickup was Saturday, although there was some question as to whether the rain would cause a postponement. It poured all Friday night but Saturday brought clearing skies and sunshine - perfect! around the syrup can & queen cage at the top of the box. I originally planned to bring the package inside on the back porch temporarily, but changed that to the bench outside the porch door. That was because the bee pick-up area had bees flying everywhere and the packages had dozens of loose bees on them, including the package the gentleman handed me. All the way home I could hear busy buzzing in the back of my jeep. After I got them unloaded, I lightly sprayed the package screens with sugar syrup mixed with a touch of Honey-B-Healthy. By the time I came back out with my camera, all was quiet as the bees feasted. The exciting moment came during the installation process after I removed the sugar syrup can. I pulled on the attached shipping strap to which the queen cage was supposed to be attached. No queen cage! Now what. I was pretty sure it was on the bottom of the package under a pile of bees. I quickly called the bee folks who told me to dump them into the hive and try to catch the cage as it fell out. Just what I wanted to hear, especially since bee gloves are still on my to-get list. I procrastinated getting bee gloves because I hadn't planned to use them for this procedure, although I know they're handy for certain situations. It appeared I had one of those certain situations. I grabbed Dan's welding gloves which are way too big and therefore awkward, but I managed to catch the queen cage and proceed as I was supposed to. The next morning (yesterday, Sunday) it was raining again. Less bees were flying but some were on the outside of the hive. I checked my feeder and added more sugar/HBH syrup. Lots of bees were busy feeding which made me happy. The package box was empty so I took that away. The weather is supposed to clear in a day or so and I'll check the queen cage then. I'm fairly certain she's free because I followed the advice to poke a small starter hole in the candy. Some of you have asked about the placement of our hive. I tried to choose a spot which would have a decent amount of summer shade, plus be protected from bitter winter wind. Below is a detail from our 2015 Master Plan. 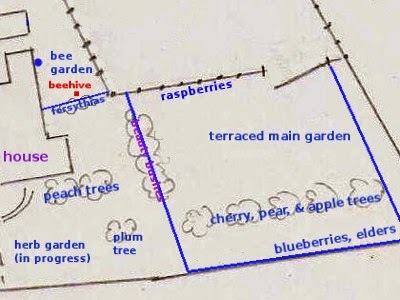 Detail of our current Master Plan including bee garden and more. Things we've added are in blue. The blue lines indicate fencing. The red dot is where Honeysuckle Hive is located. On the full version of the plan that side yard is named "Bird Garden." As you can see, we have renamed it "Bee Garden" because I believe it will accommodate several more hives. What's nice is that I can see the hive from my kitchen window (near the blue dot which is one of our rainwater collection tanks). Not too long ago I was reading Kaat's post at Robin Hill Gardens about making candy boards for her honeybees. I saw she mentioned adding Honey-B-Healthy to the mix. I had no clue as to what that was and had to do some research. Honey-B-Healthy (HBH) is a feeding stimulant which is added to bee feed as a supplement. It was developed at West Virginia University from research done by J. W. Amrine and R. Noel, Jr., on the use of essential oils (EOs) for controlling honeybee mites. It has been developed into a product for sale, but also(!) I happened across a recipe for it at The Wasatch Beekeepers Association website. The recipe would enable me to customize it a bit, so I decided to buy the essential oils and make my own. lemongrass, & lavender essential oils, plus 1 drop hand dish liquid. The key ingredients to HBH are spearmint or wintergreen essential oil and lemon grass essential oil. Researchers found the spearmint and wintergreen EOs to be especially helpful in treatment of mites, however, the bees themselves didn't care for it. The lemon grass was especially appealing to them, so it became the other standard ingredient for HBH. The lavender essential oil is also offensive to Varroa mites, so it was an easy addition. Because water (in the sugar syrup) and oil don't naturally mix, lecithin and drop of liquid dish detergent are added as emulsifiers. Dosage is 1 - 2 teaspoons HBH to 1 quart of syrup. In one of his videos, Chris Harvey at The Warré Store recommends 2 parts sugar to 1 part water, with 1 tablespoon HBH per quart for the initial feedings after installation. That brings us to my new feeder (made by Chris) which is said hold up to a gallon of sugar syrup. Warré hive top feeder. It is placed on top of the top hive box (more here). The bees come up beeways on the sides. Mesh keeps them in the bee area. If you read the claims for Honey-B-Healthy, you'd think it's really the bee's knees: helps control Varroa mites, helps prevent absconding (which is where the bees, for whatever reason, decide they don't like their new hive and simply leave), faster drawing out of comb, helps prevent rejection of a new queen, helps calm the bees, and helps prevent stinging because the lemongrass essential oil contains some of the same natural pheromones that bees use to attract workers. The only negative is that it promotes robbing because the bees love it so much. The only precaution I could find is that EOs evaporate fairly quickly and so keep them and the HBH tightly covered until time to use. Bee pickup is today if it isn't rained out, so I will know shortly whether or not HBH lives up to its claims. I'm hoping I won't need to feed for long because things are blooming around here. My honeybees will have missed all the early spring blooming, such as the fruit trees, but things like clover, honeysuckle, and the roses have yet to bloom. Then there will be the gardens. I'm also working on lists of new things to plant because I definitely want happy honeybees. And one more, a video using honey as an emulsifier for the EOs. Warré hives are not usually painted. I suppose no paint goes with the natural in natural beekeeping. But our humidity is such that our outbuildings all grow a patina of green mold wherever they remain in the shade. For the service life of the hive, I decided to paint it. I started with white barn paint because we had a partial can in the carport. At one time it was standard to paint beehives white. I read that was because white implied cleanliness in handling a food product. Nowadays any color goes and if you do an internet search for images of painted beehives you're in for an eye candy treat. Even though I plan to keep my hive out of our scorching southern sun as much as possible, I decided to start with white as a base color because of our summer heat. It was the naming that gave me a theme for painting. It's funny because I'm not one to name things. I've never named a car or bicycle, our homestead doesn't have a name, and neither do any of our chickens. Heck, I'm usually slow to name our goats. But for some reason I had no trouble naming our beehive. I got the idea after reading a professional beekeeper discuss his commercial hives. They were named according to location and number, and that made sense to me. Since I'm hoping to eventually have several hives, naming them seemed like a good idea. Our first beehive will be Honeysuckle and it turned out better than I thought. I had hoped to have set it up outside by now, but it's been pouring rain. Hopefully that will subside soon because bee arrival day is imminent.